Her blood pressure was at life-threatening levels as faded in and out of consciousness on the way to the hospital. On the seventh day of the seventh month in 2007, Tim and Syreeta Lazarus tied the knot. Tim remembers seeing his future bride for the first time at a career fair three years before their wedding. Syreeta gave birth to Zoila and Saniya within two years of each other. The happiest moments of the young couple’s lives turned into a nightmare. “When she gave birth her blood pressure was elevated,” Tim said. Syreeta’s pregnancy-related complications started days after she returned home from the hospital. 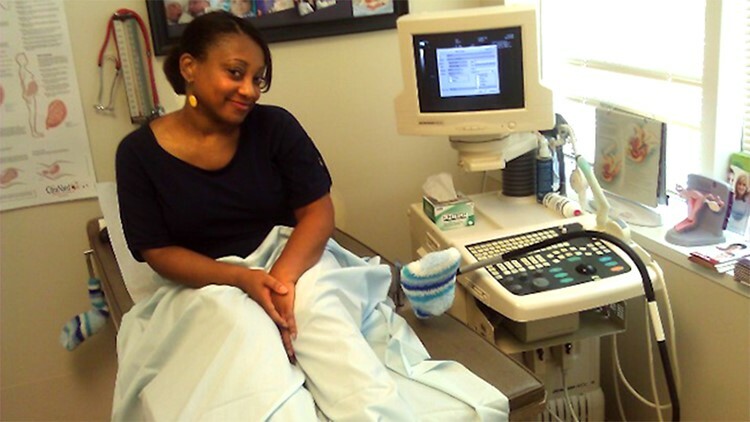 Syreeta’s blood pressure was at life-threatening levels. Tim drove her to the hospital as the new mother faded in an out of consciousness. Before Syreeta’s near-death experience, she says a nurse told her to monitor the situation and come into the hospital in a few days. She says if she would have waited any longer, she would have died. Syreeta Lazarus in the hospital. According to the CDC, 700 women across the United States die each year because of pregnancy-related complications. The United States is the only developed country where maternal mortality is getting worse. In 2015, the Global Burden of Disease study published that for every 100,000 births there are 26 mothers who die in the United States. In 2013, Texas legislatures established the Maternal Mortality and Morbidity Task Force. The task force’s job is to study and review cases of pregnancy-related deaths and trends in maternal morbidity and make recommendations to help reduce pregnancy related-deaths and severe maternal morbidity. The task force’s most recent report includes a complete review of 118 pregnancy-related deaths in 2012, a list of findings and what they recommend reducing maternal mortality. 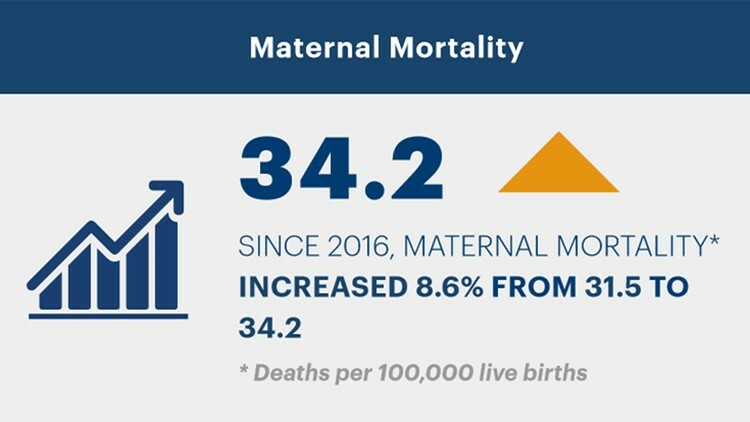 America’s health rankings by the United Health Foundation show Texas’ maternal mortality rate continuing to climb from 2016 to 2018—at 34.2 deaths per 100,000 births. To combat Texas’ rising maternal mortality rate, the Department of State Health Services has teamed with the Alliance for Innovation on Maternal Health (AIM) and the Texas Hospital Association (THA) to create the TexasAIM initiative, which will help hospitals and clinics in Texas carry out maternal safety projects. Maternal mortality is on the rise since 2016. The initiative focuses on reducing obstetric hemorrhage, improving obstetric care for women with opioid use disorder, and reducing severe hypertension in pregnancy. As of July 31, 2018, there are 181 hospitals enrolled in the initiative.